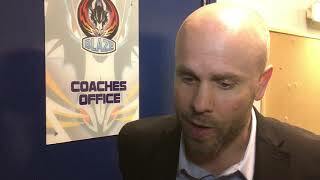 A depleted Genting Casino Coventry Blaze team suffered a heart-breaking late 1-2 defeat to the table-topping Belfast Giants on Saturday night at the Skydome Arena. Without Chris Joyaux from the start, assistant player-coach Kevin Noble was then forced to pull out of the game early. Later, a big hit on Justin Hache sent him to the locker room too, leaving Coventry with just three regular blue-liners and Shawn Pauly having to drop back from his forward position. 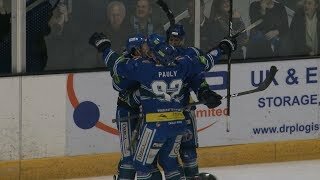 It was a monumental effort from the Blaze to keep to score tied at one until the final minute, and on the powerplay to end the game it looked as though at least a point was coming their way. However, it wasn't to be as Kyle Baun, a Calder Cup winner last season with the Toronto Marlies delivered the hammer blow scoring shorthanded at 59.01. The other two strikes in the game came in the second period with Alex Nikiforuk (23.59) and Dustin Johner (30.22) both scoring on the powerplay. It was a heated contest throughout, with the hit on Hache particularly rising tensions as fans raged at the no call on the play and the Blaze player leaving the ice needing support and bleeding heavily. Earlier in the night Captain Kevin Morris also fought Francis Beauvillier following a boarding to teammate Kelin Ainsworth.